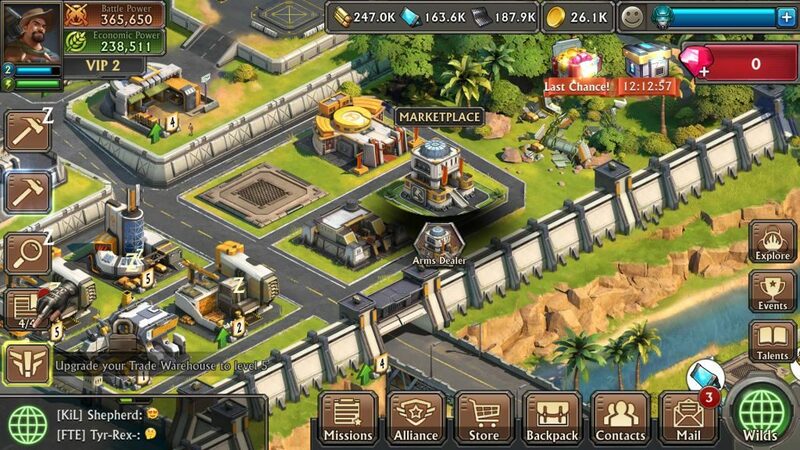 Dino War is a base-building strategy game from KingsGroup Holding. Gameplay reminds me of Brutal Age, although this game boasts exciting new features, such as real-time battles against New Dawn soldiers and evolved Jurassic-era beasts. You will need to find and tame them and then use them in combat. The game also lets you join an alliance, raid other players’ bases and hunt monsters at The Wilds. You can also explore the expansive map to hunt for beasts or just explore the battle map to fight New Dawn soldiers for rewards and glory. Headquarters: The most important and the tallest building in your base. You can level it up to unlock new structures and upgrades. 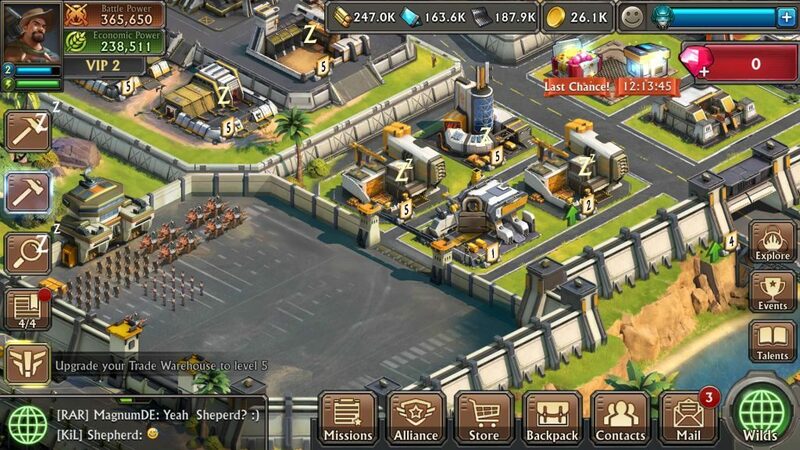 You will also get bonuses, such as increase in “march capacity” when you upgrade it to level 6. Increased “march capacity” will let you deploy more units to hunt monsters, engage enemies in real-time combat at the “Explorer Trail” and attack other players’ base. Barracks: At the barracks, you can train land units. Upon upgrading this building, you will also receive a training capacity bonus that will let you train more infantry units. Upgrading barracks also unlocks stronger units. Paddock: You can train fast-moving riders at the Paddock. Upgrade to increase training capacity and unlock more powerful riders. Range: This is where you can train ranged troops. Upgrading this building will let you unlock stronger ranged units and increase troop capacity. Units trained at the barracks, paddock and range gather at “Drill Grounds”, which is located next to all three buildings. The drill grounds is where you can get info about your current army, i.e. the total number of troops, march slots and the number of wounded units, if any. “March slots” shows the number of troops you can deploy at the same time, so if the march slot is two, then you can deploy two groups of units to two different missions simultaneously. You can increase the number of troop marches by researching “March Slots” at the Research Lab. 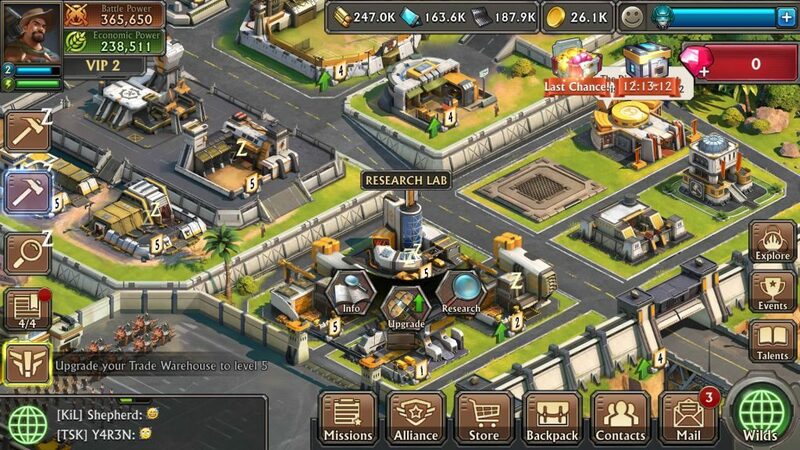 Research Lab: You can unlock and research various tech abilities related to development, troops (battle) and economic operations. Under “development”, you can research construction speed to increase the speed of building construction, hospital capacity to heal more units, troop training capacity, training and healing speed, march slots and many more. Upgrade to unlock more tech options. Under Battle, you can research abilities, such as Troop attack and Troop damage (infantry, ranged and rider units) – this lets you increase the damage dealt to enemies by these units. You can also research Troop defense and health if you don’t want to lose too many units at the battlefield or while raiding enemy base/fighting high-level monsters. You can also research “March capacity” to increase the number of troops you can send in each march. 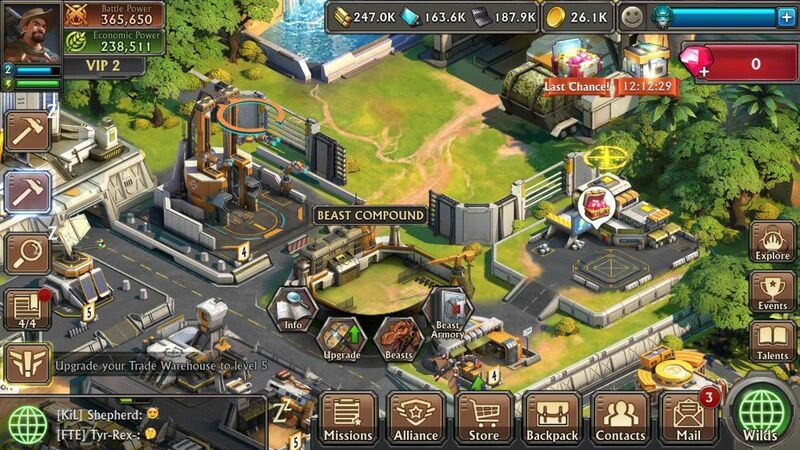 Under Economic Operations, you can research “resource production” to increase material, energy and ammo production. You can also research gold production, gold gathering, energy and ammo production if you don’t want to fall short of resources. 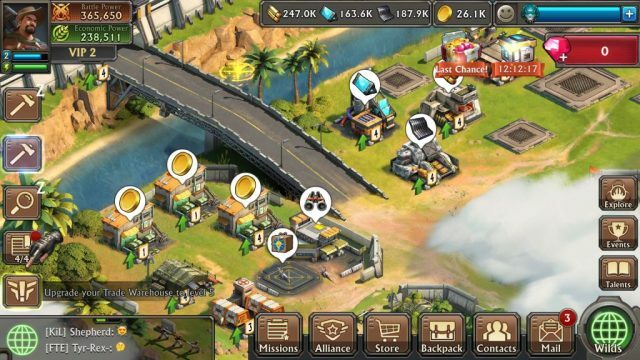 Construction Plant: This is where you can manufacture Steel, which can be used to upgrade troop buildings and your headquarters. Steel can also be traded in exchange of pink diamonds at the Trading Post, which is located next to Beast Compound. You can sell steel by tapping the “Trade” button at the trading post. Upgrade to get higher-level steel so that you can use it to level-up higher-level HQ and troop buildings. Arms Dealer: This is a marketplace where you can buy commander EXP, relocators, rare materials and pieces using the game’s primary currency, gold. Trading Post: A place where you can trade materials for diamonds with other players. You can buy or sell materials, plug-in parts and assembly pieces. Upgrade this building to unlock more items that you can buy/sell to other players. Mess Hall: The best place to get cool rewards. The Mess Hall is divided into three parts – Daily Rewards, Welcome Shipment and Daily Drop. You will have to activate “Daily Drop” to receive diamonds, speedup items, commander EXP, high-grade polymer which is used to craft equipment for your commander, ammo, energy and other resources. In Daily Rewards, you will have to complete certain tasks, such as train a certain number of units, kill an “X” number of monsters and sell goods to get points. You will need to reach point targets to unlock reward packages. You will get the first reward when you collect 30 points by completing tasks. The Welcome Shipment shows a list of rewards you will be receiving every day. Rewards include speedup items, big shipment, relocators, gold and steel among other items. Beast Compound and Recovery Station: This is where you can take care of your beasts. You can have a look at your unlocked beasts and their abilities. Upgrading this building will increase your control level limit, which means you can take control of beasts at the battlefield. Wounded beasts can be healed at the recovery station. Level up this building to boost recovery speed. Radar Station: With radar station built on your base, you can easily detect incoming enemy marches. All you have to do is tap this structure and then tap “Radar” to view incoming marches or attempted recons by your enemies. You can increase your radar’s range by upgrading this building. Arsenal: You can make your commander stronger by equipping gear to him. Gear items can be crafted at the Arsenal. You will need certain materials, such as high grade polymer, power cores, alloy parts etc. Equipping gear to your commander will increase damage, defense attack and other attributes of your troops, such as riders, infantry etc. Embassy: Build the embassy to send and receive timer help to alliance members so that you can decrease upgrade times of your buildings. You can also send defensive reinforcements to alliance members. Once you have built the embassy, join an alliance to start sending/receiving timer helps and reinforcements. Upgrading this building will increase timer help duration (faster upgrades!) and reinforcement capacity. Shelter: Produces gold. Upgrading this building to increase production. Material Workshop: Produces material, one of three main resources required to build/upgrade buildings and train troops. Ammo Factory: Produce ammo. Upgrade to increase production. Energy Generator: Produces energy. Upgrade to increase production. When resources are generated, their icons show above these buildings. Just tap any one building to gather all resources. Hospital: You can heal wounded troops at the hospital. You can upgrade it to increase the capacity of wounded troops for healing. This building is located next to shelters. Intel Post: A courier service comprising of dinos that bring items or Intel every 3-4 minutes. You can receive timer speedup items, rare materials and most importantly “intel” that reveal bunkers. These bunkers may contain new beasts or beast plug-in parts and pieces. Once you receive it, tap the binocular icon that appears beside the intel post to locate bunkers and send your troops to collect crates, components and serums. You can find this building close to the hospital. Trade Warehouse: If you want to list more items at the trade post, just upgrade the trade warehouse building. Upgrading the warehouse also protects resources stored in it. Keep upgrading to increase storage protection. It is located next to the ammo factory. Event Center: Located next to the Arms Dealer, the event center keeps you updated with the latest events, which can help you get more rewards. Keep an eye on such events and complete tasks relevant to an event to get diamonds, energy shields, training speedups and other rewards. You can find the event center near the Arms Dealer.